This post was provided by Complete Track and Field. Here are three Glute-ham Complex exercises that can add variation to your workouts. 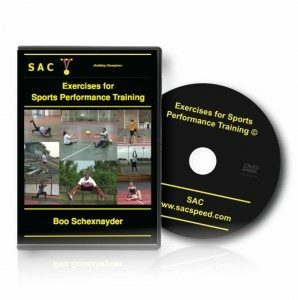 These exercises will work the posterior chain and help improve acceleration, and especially top speed, while helping to prevent injuries. We are all more than likely well aware at this point that the posterior chain, Glute-Ham Complex, Backside, or whatever else you would like to call it, is absolutely critical in all areas of human performance. Success in everything from power lifting, Olympic lifting, bodybuilding, team sports, injury prevention-treatment, aesthetics, etc. automatically demands that the hips be operating at the highest degree possible. In this quick article I’m going to hopefully introduce 3 new hip dominant exercises that do an outstanding job at developing this part of our anatomy, as well as discuss some of their specific roles in training. The posterior chain helps regulate all physical aspects of life. The stability ball leg curl has existed for awhile from what I’ve seen, but progressing the pattern by means of external load with 45-100 lbs. plates, is not that common. I should also note right away that all of the drills I’m going to share are generally more effective with moderate to high rep ranges (i.e. 8-16 reps) for two reasons. First, I think working within this rep spectrum assists in CNS preservation since the intensity is naturally lower. Another by-product here from what I’ve read from several credible sources is that the legs seem to respond well to higher levels of time under tension. Secondly, exercise compatibility with these number of reps is achieved since the capacity to load the movements can be pretty difficult even if an athlete or trainee is fairly strong. This drill has been slightly modified from the original version that was shared with me by one of my mentors and friends: Kelly Baggett. Kelly opted for a dumbbell and I think that implement works as a great variation! The other option is obviously loading the exercise with 45 or 100 lbs. plates and then distributing the weight at various points at the posterior leg to alter leverage and serve as another source of overload without necessarily increase the poundage. Or add more weight, or combine altering leverage and add the weight. There are lots of ways to approach the situation here. And when the cable pull-through is no longer sufficient enough to really challenge you or someone else, enter the sled or car! The potential for increasing stress and intensity to the posterior chain is very high here, and I believe the exercise is unique to the best of my knowledge. All of these drills do a solid job of applying direct stress to the hips, thus increasing local growth and strength endurance qualities. Moreover, I’m certain that these exercises will help improve acceleration, and especially top speed since the glutes and hamstrings are so dominant in generating horizontal force and power at the latter stages of a sprint, which are necessary precursors to “breakaway” ability according to research. 1 2 3 Just check out any of Bret Contreras’ books or articles on his site and you will see what I mean. Another reason why I love these exercises is because they serve as a great source of training variation, without in any way compromising exercise selection quality. We all know that bilateral and unilateral RDL’s, GHR’s, Swings, Sleds, etc. are staple movements for building strong, big, and powerful hips and I have no doubt that these drills can contend if executed correctly. Last but not least, these 3 exercises shine in terms of addressing injury prevention/general treatment, either directly or indirectly at the groin, hamstrings, hip flexors, or quadriceps muscle groups. These areas are repeatedly beat up and injured during sprinting and other athletic based movements. For example, Anterior Pelvic Tilt (APT) as you know is a very common local dysfunction that occurs for a variety of reasons. Gait patterns, sitting, mechanics, poor exercise selection, and several other factors can encourage APT. Fortunately, building strength in these exercises can dramatically counteract anything that can potentially disrupt muscle balance and symmetry at the hip and cause APT. I should also note that APT can both directly and indirectly cause strains of the 4 muscle groups I previously mentioned. The other area where these drills become valuable is by addressing “Specific Strength” of the glutes and hamstrings. When you consider landing impacts in excess of 3 times our bodyweight upon landing during a sprint, and the specific joint and muscle actions these muscles are responsible for, and their relative high level of activity after initial acceleration, then it’s no wonder they are susceptible to injury if they become underdeveloped for whatever reason. I’m sure that most of you reading this already knew to some degree just how vital size and strength of the hips are for literally everything in life, and now there is even more confirmation. Try each of them for awhile and I think you will be pleased.